The pattern is a mistake rib. For my scarf I CO 23 stitches. The mistake rib is simple. You just do a K2P2 rib on every row. Why does it not look like normal ribbing? The pattern is "off" by 1 stitch because you're only casting on 23 stitches. So, only every other stitch lines up with a knit or purl. The others line up on top of each other similar to seed stitch. I also slipped the first stitch of each row purlwise to give it a nice edge. In order to use up all the yarn, I cut the fringe ahead of time so I could knit until I had almost run out of yarn. To make sure I had cut enough fringe, I fringed the first side after I had knit a few inches. I did block this scarf and originally it was much wider (probably 5 inches wide) but after some wear the mistake rib pulls back in. If I did it over again I would either add another ball of yarn to make it longer (to compensate for the narrow width) or add another 4 or 8 stitches to the cast on to make it wider. The yarn looks very soft and cuddly in the picture but it really isn't. It has a classic wool feel. I think some people would say it's scratchy. The color variations in this yarn are great. Here's a closeup of the fringe. 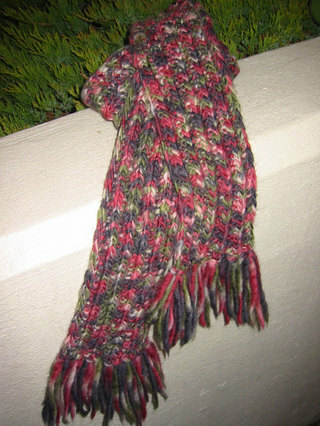 After washing the scarf the yarn puffed up and the fringe untwisted a bit, giving the fringe ends a soft V-shaped edge. Since it's single-ply it just loosened up like that. I like!